When trading, the prospective profit should be at least 3 times greater than the possible loss. Loss is defined by the size of the stop and profit can be defined by the next support or resistance relative to the one we use as an entry point (trigger). Which one of the two (nearest support or resistance), depends on the strategy we employ. This ratio should be at least 1:3 whatever criterion someone uses to define losses and profits. Of course there are strategies that don’t apply the ratio but we believe the results can be optimized by using it. The rationale behind it is that if someone uses a fixed stop and number of shares in every trade, he/she can lose two trades (67%) and win only one (33%) and still be profitable, if the target in the profitable trade is reached. Lets say that trader A has a fixed stop of $1 and a fixed number of shares say 1000. If he performs two losing trades (price hits stop), the cumulative loss would be $2000. But if the next is a profitable trade and reaches the 1:3 ratio, then the profit would be $3000. Finally he will earn $1000 minus commission. The rationale of course is simplistic because nobody guaranties that trader A will have only two losing trades instead of 10 or 20 consecutive and nobody also guaranties that in the third trade he will reach his target. Besides its drawbacks and simplistic rationale the 1:3 ratio is important in trading because it improves risk management and augments the possibility of profitability. 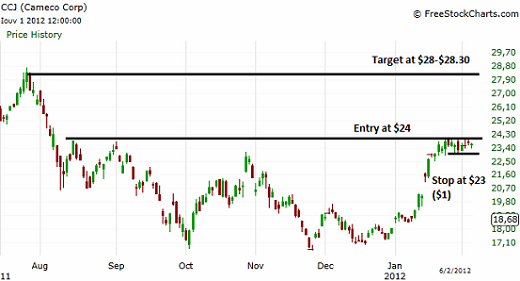 In CCJ we will open a long position above resistance (trigger) at $24, put a stop loss a few cents behind the nearest support and define a profit target at the nearest resistance ($28). So, maximum loss is $1/share and possible gain is $4/share. The loss/profit here is 1:4 which is even better than the 1:3, so from that point of view it is Okay to enter. Notice that we didn’t set the target at the pick of the resistance candlestick because sellers might start selling stock long before price reaches this point. Also many times the price will stop ascending before it even approaches close to the target. In this case it might hit the profit taking stop and live as with a smaller profit than initially planed.